Ever After High large school backpack 16" Bag Adjustable Straps for a Personalized Fit, Padded.. Ever After High 16" Large School Backpack with matching Lunch Bag * Backpack - Adjustable Str.. 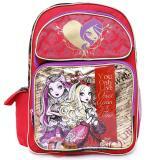 Ever After High Large Roller Backpack, School Bag with matching Lunch Bag *Roller Bag - Adjusta..